The SLA Inspiration Award aims to set future standards for the recognition of excellence in school library design. The Award will be made annually to the school library space that shows inspiration, innovation, creativity and resourcefulness in its library design and in use, either through creative use of specific products or promotions. Gresswell sponsored the SLA Inspiration Award for secondary schools and attended the award ceremony yesterday (6th Oct). Each finalist was given a chance to present their Library to the attendees before the winner of the award was announced. Chris Riddell, Illustrator and author of ‘Goth Girl’ presented the winners and runners up with certificates and prizes, including a £500 voucher for the winners to spend at Gresswell on our range of library furniture and supplies, and a £100 voucher for both the runners up. 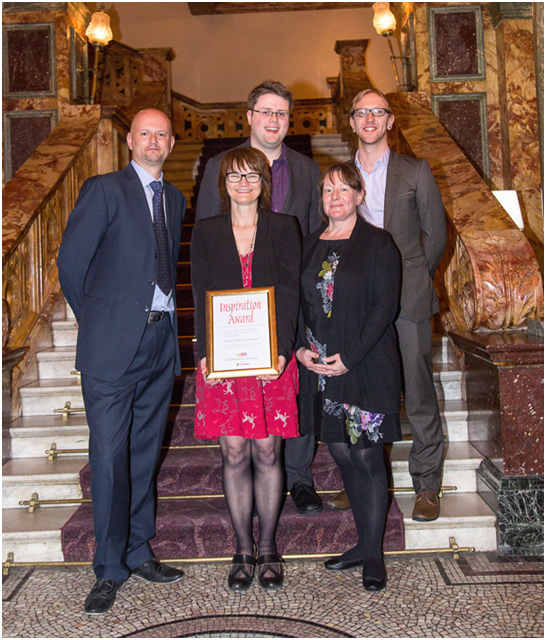 Congratulations to Dixons Allerton Academy (@DixonsCA) proud owners of the UK’s Inspirational Secondary School Library 2014.
with Greg Rixon, Gresswell Customer Services Manager. © Philip Cooper Photography Images: Dixons Allerton Academy Library. Dixons Allerton Academy’s Library is exceptional. 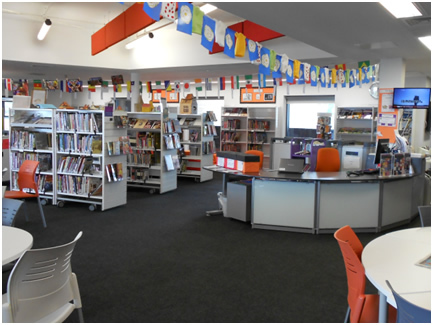 The library is positioned over the entrance to the school, a central point, bridging the gap between the Secondary School and the Primary school which are both located on the same campus. 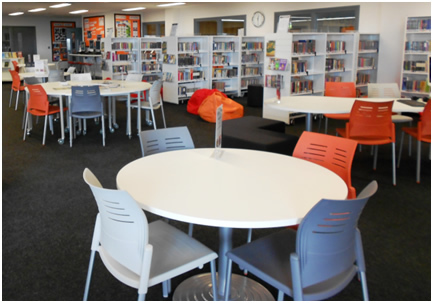 The previous school Library used buckets to catch drips from their leaky ceiling, so needless to say their brand new space is quite a contrast from the old one with modern, interchangeable work spaces, brightly coloured seating, and “The Portal” – a collaborative workspace used by small groups, equipped with workstations and beanbags for flexible learning – a brilliant space within a space. We were busy tweeting live pictures and quotes from the speakers, and the shortlisted schools which can be found by searching the official hash tag #SLAInspiration14 or by viewing our tweets at @GresswellUK. Think your Library deserves the SLA Inspiration Award? Gresswell will be sponsoring the award in 2015 so look out for further updates before the end of the year for your chance to win! Following our previous article about diversification of Public Libraries, we’d like to share with you some services being offered by some of the most imaginative Public Libraries in the UK. They now provide a range of services that entertain, inform and meet the public need. Want to build a robot? Or Learn to Cook? 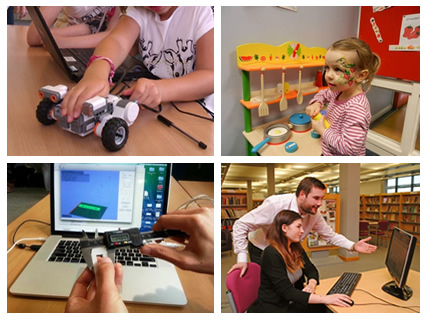 Along with Fab Labs and Job Clubs these are a few services that have made their way into four of the UK’s most innovative Libraries. Neath Port Talbot Libraries (http://www.npt.gov.uk) have been working with local schools to get kids involved with building and programming Lego Robots – the aim was to create excitement around Science, Technology, Engineering and Maths. Inverclyde Libraries (www.inverclyde.gov.uk/libraries) created a Health and Literacy project named “Alphabet Soup”. Cookery demonstrations and recipe competitions were used to promote Health and Cookery related Books and resources. Exeter Library (http://www.devon.gov.uk/exeter_central_library) opened the UK’s first Fab Lab in a Public Library back in May 2014. It is now a hub of technology and provides courses and workshops for its 3D printers, CNC Routers, 3D Scanning Machines, Digital Sewing Machines and more! Northern Ireland Public Libraries (http://www.librariesni.org.uk) are working together with Job office staff to help people looking for work to gain the confidence and skills necessary. They give expert advice and find local opportunities. Do you know of any Libraries providing innovative services? With Libraries offering even more additional services we’ve been looking out for ways to help you promote your new services, new books and events. 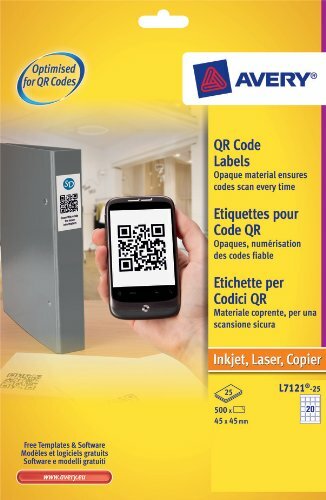 QR code labels are a quick and easy way to provide Links, Contact information, Social Media links, Event information and more to anyone with a Smart Phone or Tablet device. Label dimensions are 45 x 45mm and as with all Avery labels there would be templates and software available to download to help you create and print your own QR codes. Labels would be provided in packs of 500 (25 sheets of 20 labels), are suitable for inkjet/laser printers and copiers and would be priced at approx. £11.99 per pack.